Strategic considerations and publications dealing with the future of industrial production are significantly influenced these days by the concept of "Industrie 4.0". For this reason the field of measurement technology for industrial production must also tackle this concept when thinking about future trends and challenges in metrology. A research activity in the context of ambient assisted-living and Internet of Things applications is presented. A new assistance system with an integrated, multi-sensor, low-cost, autonomous, smart spoon device, denoted as Lab-on-Spoon, has been conceived. The goal is to provide assistance for unskilled or challenged consumers by sensory context in ingredients and cooking results. Successful liquid ingredient recognition and quality assessment, i.e., rotting and contamination, was achieved. All-solid-state reference electrodes were developed based on particles of graphite/silver/silver chloride synthesized by electroless deposition of metallic silver and silver chloride on graphite powder. These electrodes were not sensitive to abrasion, redox species, pH and high-pressure saturated steam, and were applied successfully in potentiometric cells to measure pH and potassium ions in a complex matrix by direct potentiometry and L-ascorbic acid by potentiometric titration. Editorial "Not just another new journal of sensors"
“Industrie 4.0” or the Industrial Internet of Things (IIoT) describe the current (r)evolution in industrial automation and control. This is fundamentally based on smart sensors, which generate data and allow further functionality from self-monitoring and self-configuration to condition monitoring of complex processes. 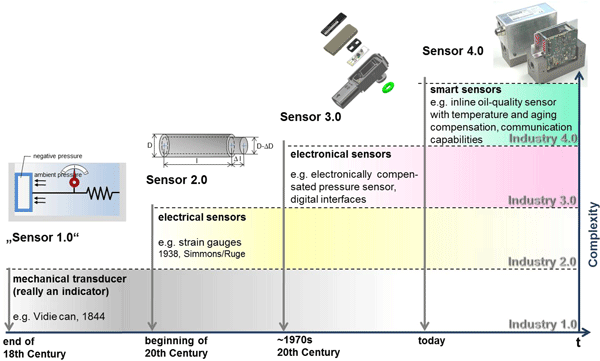 The paper reviews the development of sensor technology over the last 2 centuries and highlights some of the potential that can be achieved with smart sensors and data analysis. We have analyzed the requirements of a smart heating system and, in particular, the necessary sensors and their integration in a control system. The system comprises temperature and localization sensors as measuring elements and heating foils as actuators. The system components were studied in a demonstrator room, and the entire heterogeneous system has now been deployed in an apartment for further field studies during the heating season of 2016/2017.